Much as I like Apple as a company, and mourned the death of Steve Jobs -- Apple's chart is not looking terribly promising for bulls. When discussing the issue with a friend, one of the topics that came up is how Apple really is (or was) Steve Jobs. The last products that Jobs had a direct hand in will be released in the fairly near future; and the charts seem to be indicating that either Apple will not recover well from his loss, or the world is going south fast. From a broader market standpoint, Apple is clearly a huge market leader. When Apple starts looking sick, it's not a good sign for the broad market. In my opinion, Apple's charts are pretty clear that lower prices are coming. By corollary, we can assume that this means lower prices for the broads as well. 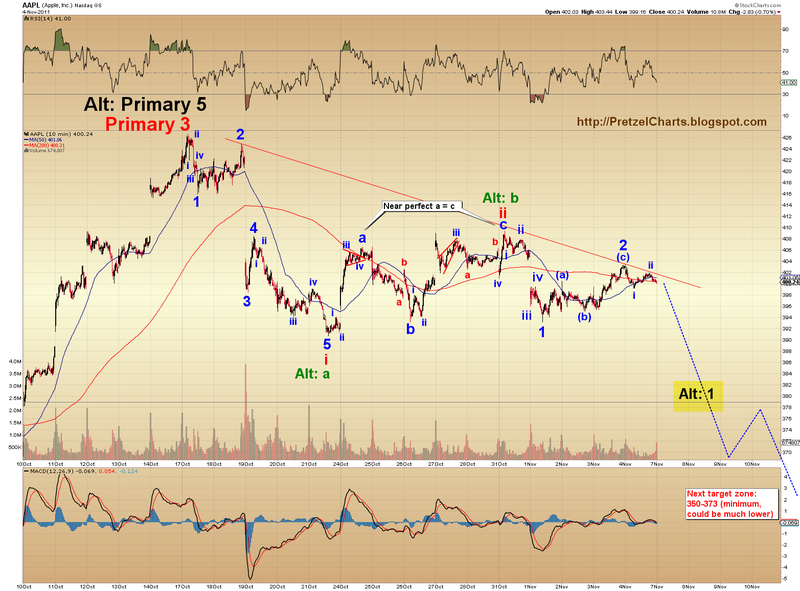 The most bullish short term scenario I can currently see would be if AAPL is forming an a-b-c lower (with wave a and b complete) for wave B of e. I realize that my labeling of "e" may not fit the traditional Elliott nomenclature; sometimes I label things more for clarity of comprehension for those not overly versed in EWT. 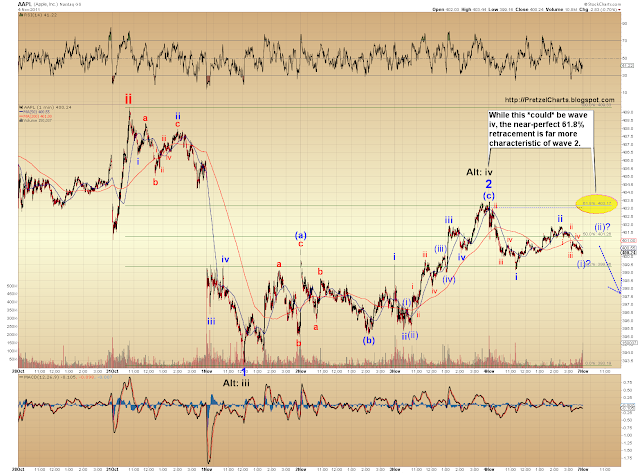 (See wave "e" on daily chart, below... this is the same chart I posted when I called the top in Apple on October 18th). I would give the B of e scenario maybe 15% odds. 1) This is part of an a-b-c as mentioned above (unlikely). 2) Red Wave ii extends upward in some fashion (but stays below the October highs) before breaking the recent lows (very unlikely). 3) Red Wave ii is actually a fourth wave, so we make a marginal new low (see black "Alt: 1"﻿) then rally slightly before we head down in earnest (possible, but unlikely due to the structure of the move down so far). 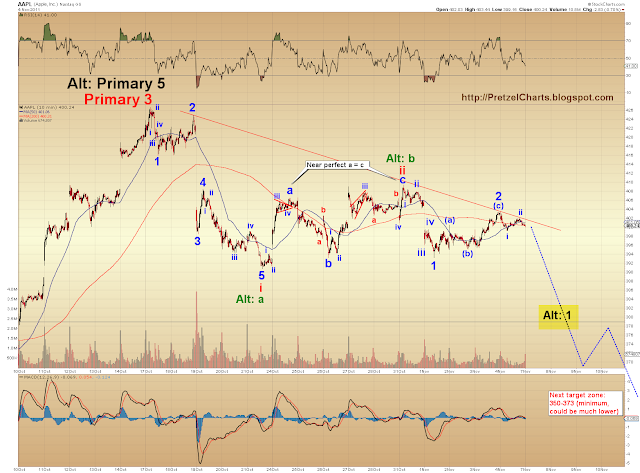 All in all, I think AAPL presents a very clear case for lower prices. In my opinion, this is about as good as it gets, chart-wise. Nothing's 100%, but this chart series is the type that makes you lean into the 90% category. It's always possible I'm wrong, but I would be absolutely shocked if Apple's next significant move isn't down. AAPL is my favorite market "barometer" :-) By gauging its health we can get a glimpse of the general market. Frank, I agree. I watch Apple like a hawk. But Apple is a very widely-held stock, with a cultish following. I doubt the broad masses who hold Apple stock are terribly in tune with RSI, MACD, and my interpretation of Elliott counts, etc.. The coming move probably isn't obvious to the majority of shareholders at all -- and that's who needs to be surprised. 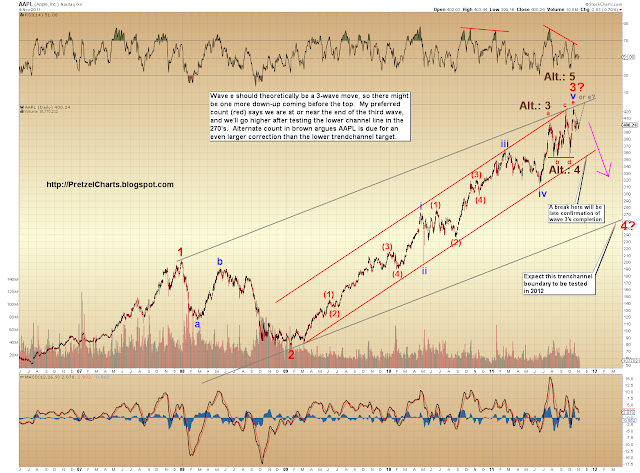 Wow, any significant move downward by mighty Apple would send the indexes tumbling for sure. And semiconductors and tech for sure. Semis have very much been a leader of the October rally, btw. I follow the forty biggest pretty closely. All are near sine August highs, other than the few that have had ER disappointments. And even most of of those are back above or near where they were prior to their ER. If we are in the beginning stages of three down as your charts suggest, I wonder how long it takes for the broad market to pick up on that? Would there be increasing momentum selling, which then sends the broad market into a corresponding freefall? I agree that there is virtually NO general market sentiment that Apple is due for downward movement at the moment. It's so widely considered a safe haven and growth stock that it seems it'd be hard to change that perception overnight. I'm rather confident that if I took an informal survey of our investment and market-savvy patrons if they'd consider shorting Apple a good idea, the results would be like 97.97777% against. Index future just moved back into slight negative territory for tomorrows open, btw. Will be curious to see how that evolves heading into tomorrow's open. 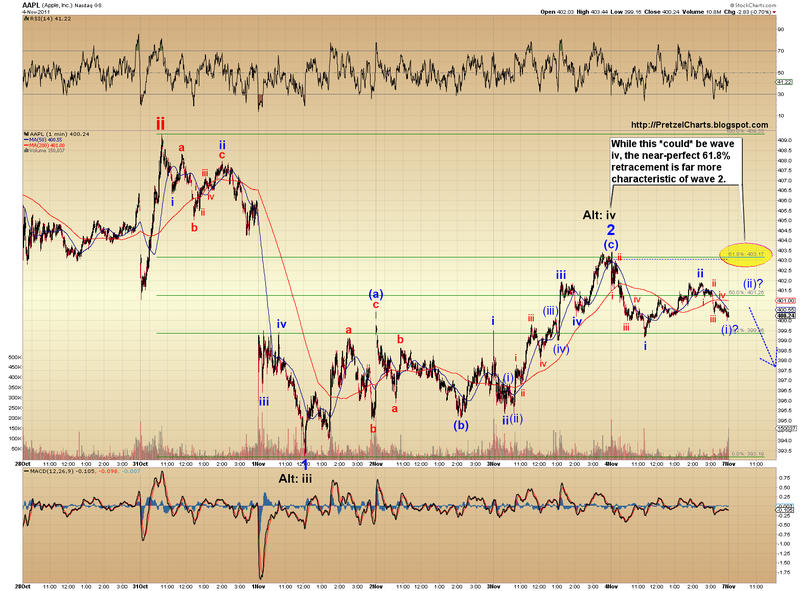 Alright, gotta wrap up the SPX update and charts. I'll be around, popping in from time to time, since I'll be online for awhile finishing the article. P I'm amazed at the quantity of analysis you have presented, with SPX to come. Please don't burn out on us. As you present multiple bearish signals, I think I understand better why you have been telling the bears to not be afraid. Interesting. Glad I unloaded my few AAPL stocks last week for a big fat 100% gain! This multi-year relentless increase in share price has to stop and revers at some point, as with anything, and the time is now. AAPL down; the rest will follow. Simple as that.